I’m such a sucker for red velvet anything. The problem with that is that not all red velvet desserts are created equally. Some red velvet cakes are dry and tasteless and sad. Others are as tasty as they are pretty. This red velvet sheet cake is the latter. It is moist and has great red velvet flavor. It is similar to a Texas sheet cake, and it has a lot of the same good qualities as that cake (easy to make, tender, and great flavor). The cake is topped with a tangy cream cheese icing for that nice contrast of tangy and sweet. I use a little buttermilk in the frosting to up the tang, but you can use regular milk if you prefer. If you’ve tried this red velvet sheet cake recipe, don’t forget to rate the recipe and leave me a comment below. I love to hear from people who’ve made my recipes! You can SUBSCRIBE to receive my latest recipe newsletters or FOLLOW ME on FACEBOOK, INSTAGRAM and PINTEREST for even more delicious food. Preheat oven to 350F. Grease a 15x10-inch rimmed baking pan. Set aside. Stir flour, sugar, baking soda, and salt together in a medium bowl. Set aside. Remove from heat, and stir in eggs, buttermilk, vanilla, and food color.Stir until well-combined. Cool in the pan to room temperature. Frost cooled bars with cream cheese frosting. ***Whipped Buttercream Frosting is a great alternative frosting if you prefer vanilla frosting to cream cheese frosting. This cake turned out soooo good!! I doubled the recipe and baked it in a 14 x 20 sheet pan & tooknit to a church pot luck. It was a huge hit!! Thanks so much for sharing! Delicious! Moist and sweet but not too sweet. Made it for a work Halloween potluck and everyone loved it! 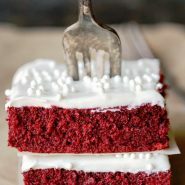 Best red velvet cake! I don’t really like red velvet cake but had to make one for an event. This was very easy to make and absolutely delicious. My daughter, the baker in the family, said it was the moistest cake she’d ever had. Thank you! I’m so glad that everyone liked it. =) Thanks for coming back to comment! Wonderful recipe! I made this for a potluck, and I got several recipe requests. Thank you for the lovely recipe! 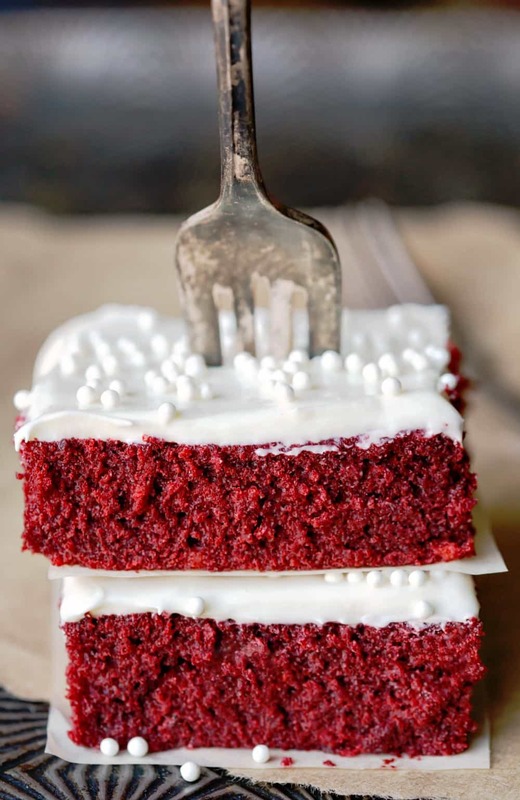 This Red Velvet is looking so delicious. Hi there! I’m curious about something. I’m making a double layer 1/2 sheet cake for a wedding shower. I’m not finding many recipes that people use for this. I want to use yours because your cake looks the most moist, but my pans are larger. They are 2 x 18.6 x 12.5. Do you think this recipe (doubled, of course) will work for this? I’m not wanting each cake to be it’s full height since I am stacking them. Just wondering what your thoughts are on the cooking time? Thanks in advance! Thank you! Gosh, I haven’t tried to double this recipe, so I’m not sure how it will work out. Normallly, when I double something (like brownies), I add 5-10 minutes on and then go from there. However, if you don’t want the cakes to be full height, they may bake in the same amount of time. I’m just not sure, and I’d hate to steer you wrong. Hi! I don’t let it cool first. I make sure that I’m whisking the whole time I’m adding, though, because otherwise the eggs will scramble. Hope that helps! Can I sub the water for milk or coconut oil? That’s usually what I do for thw majority of my recipes but I don’t want to mess it up?! I’m not sure! Can I ask why you wouldn’t want to use water? Subbing milk for water can create a richer cake, but since there’s already buttermilk in the cake, I’m not sure what effect adding additional milk will have. I would be hesitant to add a cup of coconut oil to the cake in place of the cup of water. The water helps to create a lighter, fluffier batter, and the coconut oil won’t have that same effect. Have you ever removed the cake from the pan for decorating? I haven’t. I keep the cake in the pan to frost and serve. Glad you liked it! I used regular liquid food color and didn’t have any issues with the color. Maybe all of the gel color, which is more concentrated, gave it a darker color? Hi! I am making this for my son’s lacrosse team. How many teenagers will this feed? :) It looks delicious and their team colors are red,white and black! Thanks! Normally, I would say that it makes 20-24 servings. For teenagers? Maybe half of that. =) Hope that helps! So I just baked my first red velvet cake and I must say it came out very very good thank you. I haven’t tried baking it in an 11×15. I would guess that it would work, but you would probably need to adjust the baking time. Good luck!